Sean Williams’ 69 for Zimbabwe in the third ODI against South Africa was the highest score for either side in the series and rescued his team from a dire situation. Williams came to the wicket at Paarl with the score on 44-3 after 11 overs, with South Africa leading 2-0 in the series. Determined not to end the ODI series on a weak note, Williams played superbly against a strong Proteas attack that had its tail up after three early strikes. 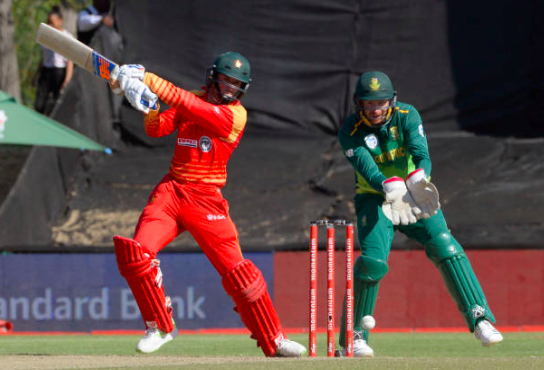 Williams and Brendan Taylor got the innings back onto an even keel, adding 73 for the fourth wicket before Taylor was superbly stumped by Heinrich Klaasen off Imran Tahir for 40. Williams contributed 40 of those runs off 54 balls, then added 34 with Peter Moor for the fifth wicket, Williams again dominating the partnership by scoring 24 off 18 balls. The 32-year-old hit consecutive boundaries off Tabraiz Shamsi to bring up his 28th ODI half-century, but his excellent innings ended in the 35th over when he chipped a catch back to Kagiso Rabada. Williams’ innings of 69 came off 79 balls and included 10 fours. It was Williams’ 28th ODI half-century in his 115th innings, and took his ODI runs tally to 3,169.